Jim a resident of Forest Lake, called us to resolve a common problem. 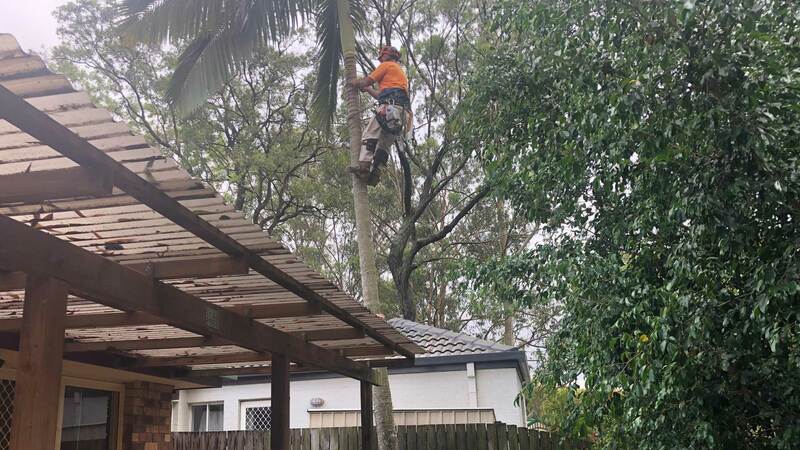 His two Alexander Palms growing along his boundary fence in his back yard had gotten too tall for comfort and needed to be removed he told us. His relationship with his neighbour, “usually a cheerful chappy”, Jim says, is now strained over this ‘matter of the Palms!’. Aside from a curt hello, we are not on speaking terms Jim confided. The solution? “Good riddance to the Palms,” Jim said. The Palm was dropping dead fronds on his neighbour’s flimsy mower shed and dinting the roof something shocking. Understandably his neighbour was not happy. “I can suffer the loss of my beautiful palms but I can’t suffer the loss of a good neighbour”, in his own words. As to the wrong and rightfulness of each neighbours actions, we reserve our opinion but you do have to stand back and admire Jim’s yielding humble spirit. He valued his relationship with his neighbour so much that the Palms were just a trifle, a dandruff fleck that needed to be flicked off the shoulder. If only more people could follow his example. But let’s not do that speel now, we’ll run out of time and mega bites. That’s a yarn for a different setting, a whole other subject. Suffice to say, Bravo Jim for your admirable contribution towards world peace. We were happy to help Jim put the smile back on his neighbour’s face. Given the circumstance, we were walking into we were especially motivated to help Jim. 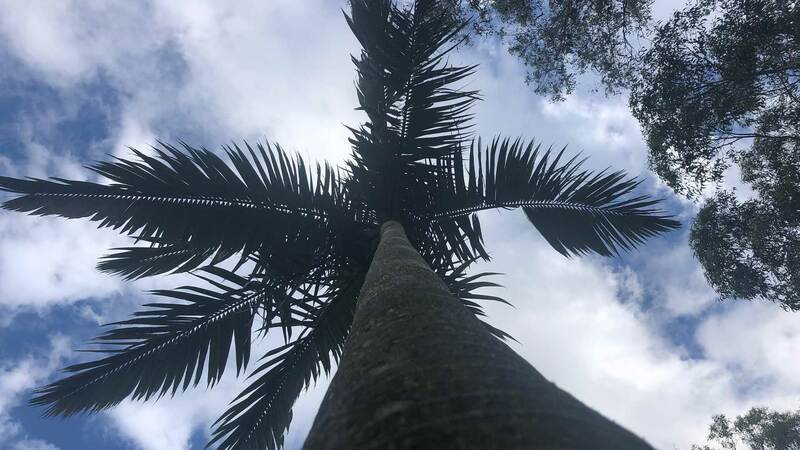 Before us was two tallish Alexander palms growing as a cluster thus typically splayed moderately. Our climber stepped into the worlds finest harness in our opinion, a Teufelberger Tree Motion, securing the 3 brass buckles with a click, click and a click, just that easy. Stabbing the Buckingham spikes into the trunk of the Alexander palm on the accent, he had reached the crown in no time. With 2 pulls of his hand saw each frond in turn slowly collapsed, folding down on the trunk before it was in hand and gingerly allowed to make its feathery descent to the drop zone. The “young leaf pointy spear” at the crowns centre axis is removed with care as it is not named a leaf spear without reason. This spear shaped growth is actually the unopened new leaf or frond and the mechanism by which each frond is born. Resembling a spear and behaving very much like one if just left to free fall unguided. This is always lowered with the climbers call for all eyes up and extreme vigilance. 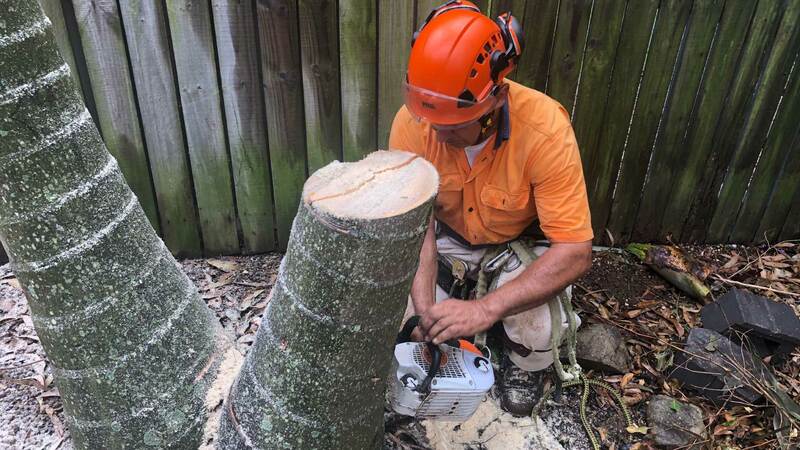 The top of the palm now denuded, he begins bringing down the trunk piece by piece with the snap cut technique, two overlapping cuts from either side of the trunk so that trunk piece is still attached, enabling two hands to snap it free with a tug and then more precisely control its trajectory to the ground. 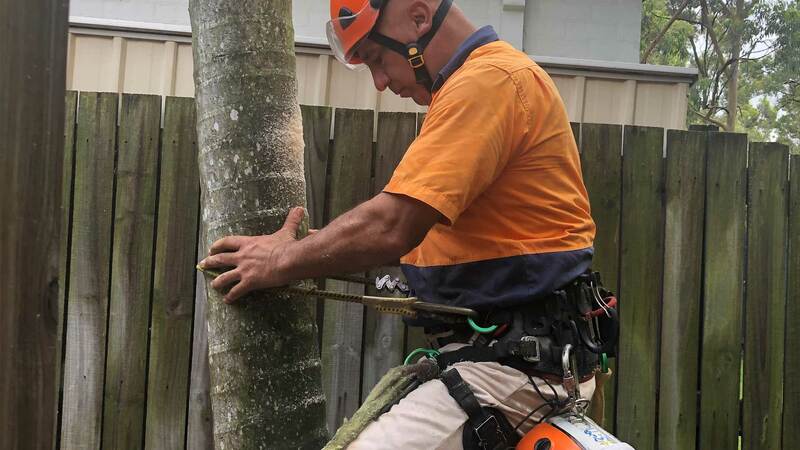 This is a common method, as opposed to rigging when removing smaller palms species like Alexanders. 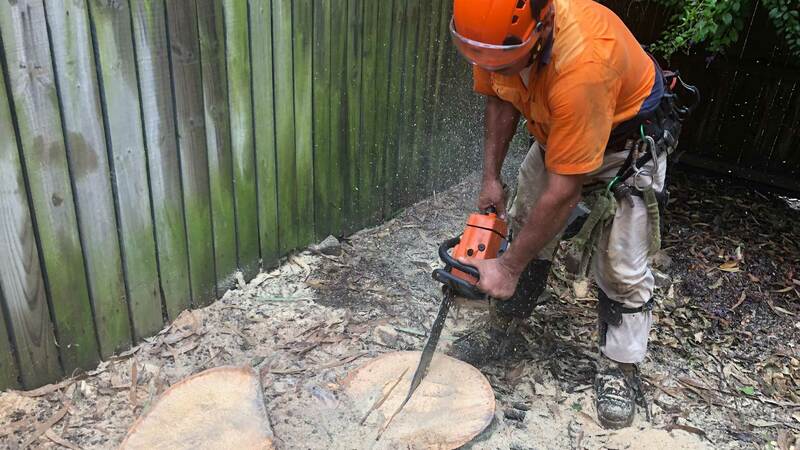 The two trunks were cut flush with the ground and the same procedure was repeated for the second palm. Well, Jim, was aghast with astonishment with every precision drop of a trunk piece, taking heaps of photos. 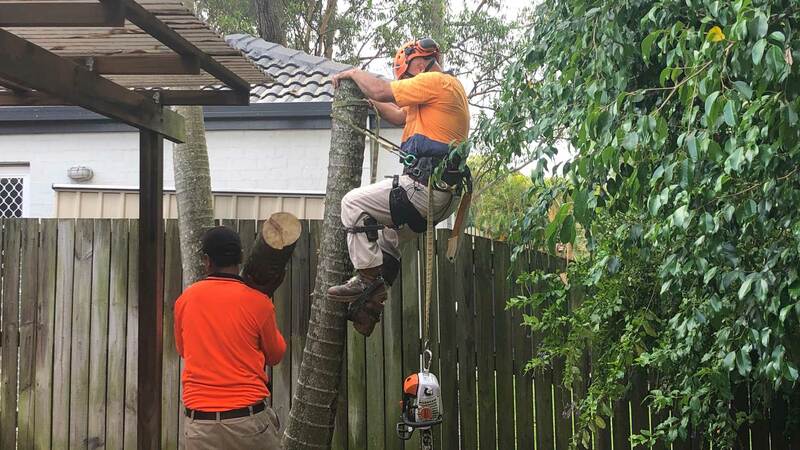 Having finished the removal with our usual flair, cleaning up the dead foliage in all the nooks and crannies in his back yard unrelated to our job, I’m sure we had stacked up a few more merit points, not that we needed them. We left Jim with a broad smile. a handshake and his assurance that he’ll recommend us to all his friends. I’m certain he will. A lot of our incoming calls preface their request for a quote with the words, “a friend of ours recommended you guys to us”. Let me tell you, it’s simply music to our ears to hear those words. Every time I hear those words it reminds me that going above and beyond for our dear customers, although is a reward in its self, will have people never forget the good done for them and feel compelled to share their good experience. And why shouldn’t they? This is what reputations are built on. the good word of others. So it goes without saying, we hold our reputation to be the most valuable asset in our business, always on guard to protect it. To paraphrase a wise man who said, “Steal my purse and you would have stolen refuse but steal my reputation and woe! is me, for you would have stolen every precious worldly possession I own”.